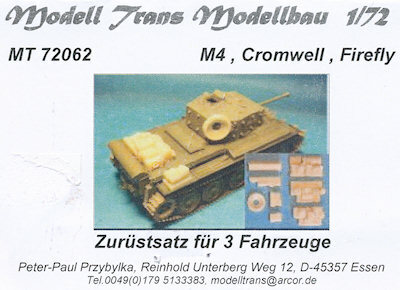 This is a rather older set from Modell Trans, but it hasn't lost its appeal over the years. Fairly small and simple, it includes a handful of stowage items for each of the three tanks mentioned in the title. The Cromwell gets a spare wheel, gas can rack, and a pallet of boxes and other items for its engine deck. The Firefly gets a hull storage bin, a small stack of boxes and rolls, and a larger pallet of items for its engine deck. And finally the M4 gets a pallet of items all to itself as well. Each pallet is composed of boxes, cans, rolled items, sacks, spare wheels, and a couple other miscellaneous nick-nacks. Sculpting is superb. Casting is pretty good as well, with only a couple of very small air holes in the resin. But there was a bit of problem with the mold on the Firefly storage bin. Luckily its on flat surfaces, so it will be easy to fix. 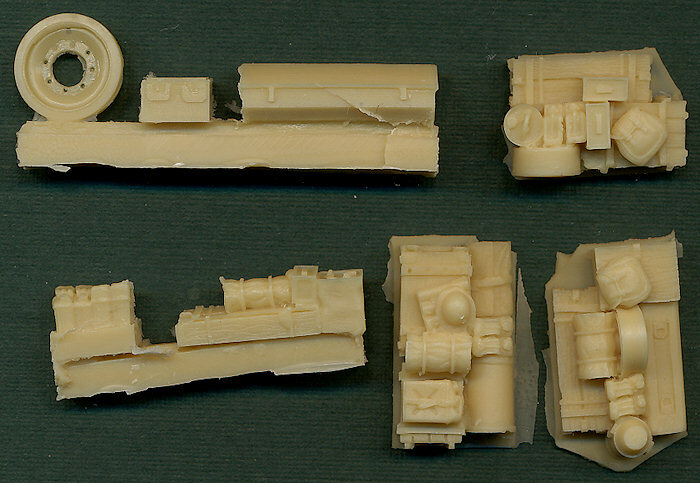 All in all, this is a fine set for quickly adding realistic piles of junk onto our model tanks.